Discover a secret world under the cloak of Mother Nature. Visual artists Patricia Astley and Catherine Luce have combined their talents to tell the story of Mother Nature and the hidden world she wants to protect. 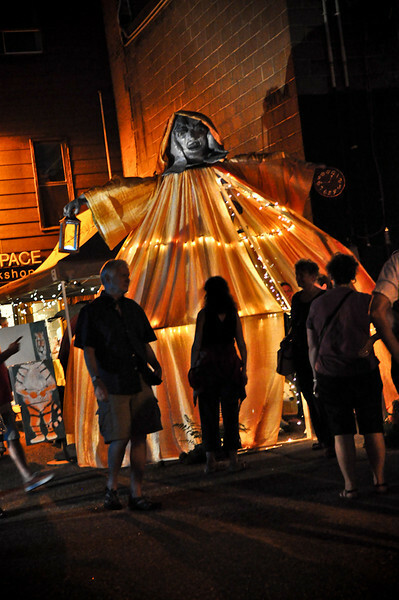 Inspired by the song Feather, Fur and Fin by Danny Michel and their concern over environmental changes on the planet the two artists have come up with an exciting interactive sculpture that is only visible once visitors step inside a large, flowing cape. This intriguing sculpture will be illuminated for the evening and enhanced with music and special effects. Children will also discover a few interactive surprises once they enter the secret world and then will be encouraged to share hopeful solutions. Patricia Astley is a multi media artist who works in oils, watercolour and is an expert in large paper mache sculpture. Catherine Luce is a watercolour artist whose whimsical art is often inspired by music. She has also produced large acrylic murals for Nature Interpretive Centres. Both artists have a background in illustration and a love of storytelling through art. 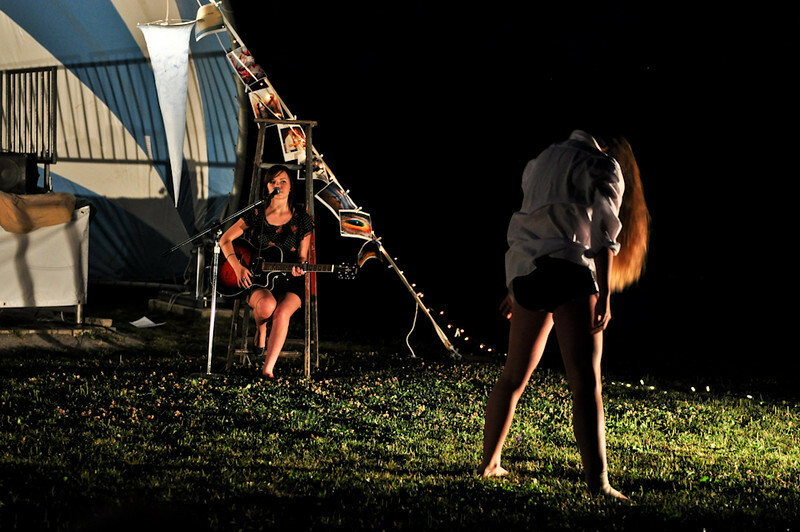 A series of vignettes combining the mediums of spoken word, visual art, photography, and contemporary dance. Poems and quotes ebb and flow between dance pieces posing questions for the audience to consider during the dance pieces about the humanity of change, the change of humanity. Performances at 8:30pm, 9:30pm, 10:30pm, 11:30pm & 12:30am. River Mill Park’s pergola will be a wash in black light as the Huntsville Festival of Arts Board of Directors takes you on a nostalgic trip with a variety of projects. If you have always wanted to take part in a choral group but never had thecourage, here’s your chance. During the event, sitting around the piano, under the guiding hand of our Musical Director Emilie Berry, you can sing your heart out, in the Park by the pergola. We will be rocking to the tune of Adele’s ‘Rolling in the Deep’ in harmony. Even if you have never done anything like this before, join us! We will provide the sheet music, our director and a ton of support.Bring the whole family. Building on the success of the installation: ‘Park Players’ 2011, ‘Park Players Return to the Future 2012’ reintroduces the Park Players but with a different ‘look’ and ‘feel’. 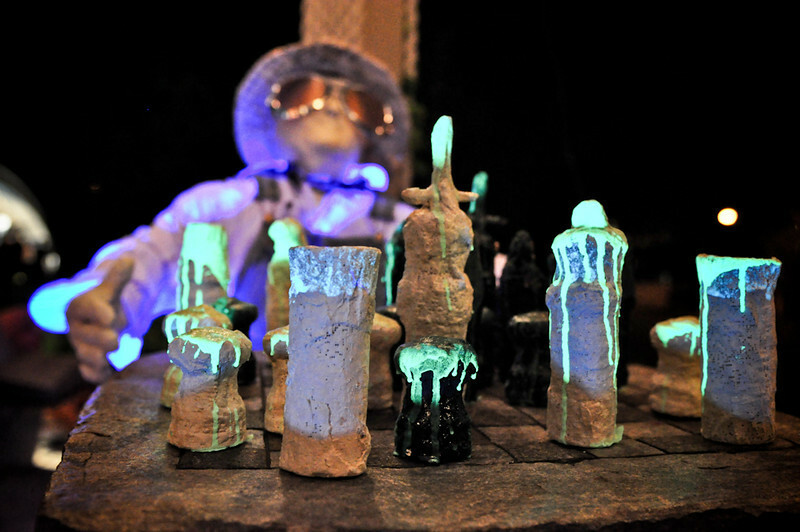 In light of the theme, the ‘futuristic’ chess pieces will appear to hover above the chess table while glowing in the dark. One of the players will be dressed in clothing covered with images of old board games as a testament to the years of enjoyment provided to cottagers. The old and the future ‘player’ bring the theme of change together under the umbrella of entertainment and cottage life. The Tree of Life is the evolution of life’s journey through the awesome power of a tree with its roots, trunk and branches representing past, present and future. 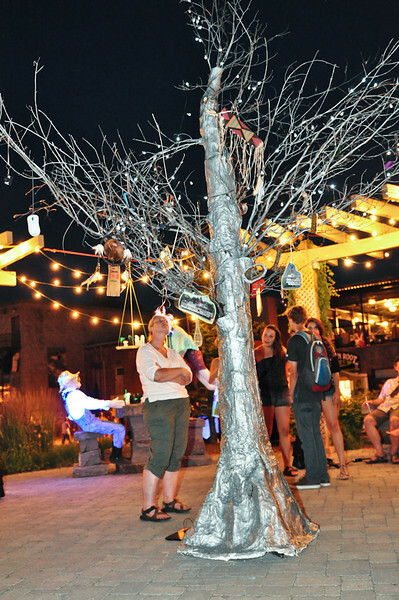 A 9 ft silver tree lit with green solar lights, and adorned with two sided photos, marks the phenomenal changes in our society over the last 100 years.